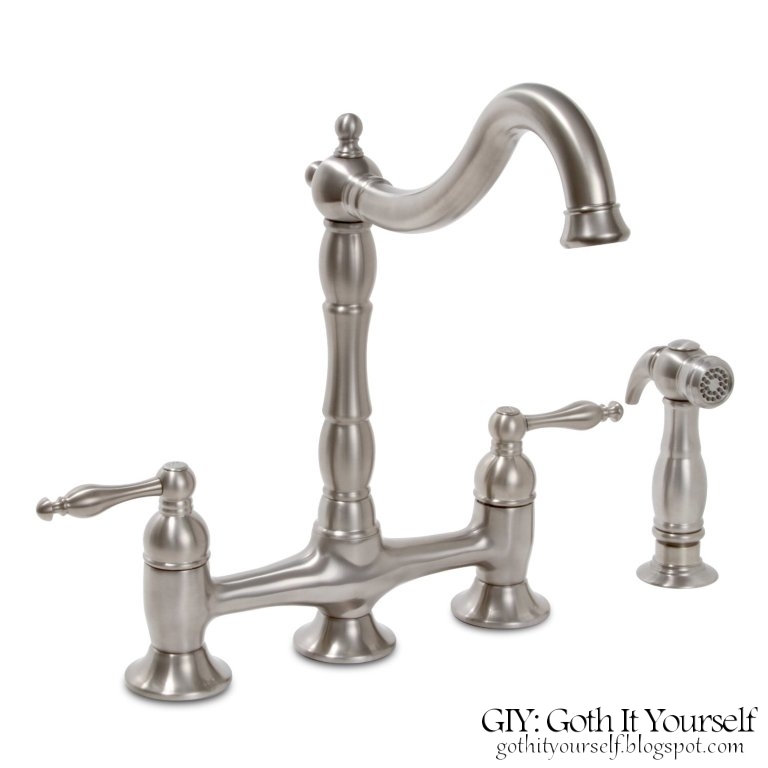 The old sink was badly scratched and the old faucet was cheap and hard to turn. The old disposal was well past its expiration date. I had to use a bucket when I ran the dishwasher. I ordered the new sink from Amazon. Now I can make the (bad) joke that I buy everything from Amazon, including the kitchen sink. It arrived in some of the best packaging I've ever seen. First, the box passed my materials inspector's sniff test. Inside the box, the sink was snuggled in its own sleeping bag. Shiny! I never thought I'd be so excited about a piece of stainless steel. I ordered the new faucet from Amazon as well. I got a good deal on a "used-like new" model which had been previously bought and returned (but never installed). I am very happy with the result! The sink and the faucet are major upgrades from what I had. And I finally have a working disposal... no bucket required! This was by far the most expensive part of the kitchen makeover at a total cost of about $760. I paid $280 for the sink, $130 for the faucet and $100 for the disposal. I could have purchased less expensive items, but I wanted a sturdy sink that would last for years and a faucet that would look really nice. As installation involved both electrical and plumbing (and I knew that there would be issues because there are always issues in my house), I hired a plumber for installation. At a cost of $250, it was money well spent. It took him three hours, a few trips to his truck, and a lot of muttering, so it probably would have taken me at least six hours, two trips to Home Depot, and a lot of cursing. One of the problems with the layout of my kitchen is that there is no out-of-sight place for the trash. The only place trash and recycling cans will fit is at the end of the peninsula, where they are clearly visible from the living room. I wanted to make them less obvious, maybe with a wooden bin of some sort. Rather than making a bin from scratch, I upcycled one of the cabinets that I'd taken off the wall. I began by taking out the interior shelf, removing the doors and hinges, and filling the screw holes on the doors and cabinet face with wood filler. I primed the cabinet face, cabinet interior, and doors. Next, I covered the center panels of the doors and the entire back and sides of the cabinet with beadboard wallpaper, and painted it all black to match my base cabinets. I also painted the interior and put down adhesive shelf paper to make sure the bin is easy to keep clean. Then I reattached the doors, placing the hinges at the bottom. I attached magnetic catches at the top of the doors to ensure they stay closed. To make this thing look more intentional and less like a cabinet just sitting on the floor, I added feet. With the cabinet turned upside down, I repurposed the interior shelf to create a base. I then attached the feet which had been cut from the same balusters that created my cabinet toekick feet. To cover the shelf/base, which is just ugly particleboard, I attached some narrow wood trim and painted it black. To make a top for the bin, I used a piece of MDF cut to size and, of course, painted black. I still plan to add pulls or handles to all the cabinet doors, including those on the bin. Other than that, the bin is complete! It holds two cans - one for trash and one for recycling. Total cost of this project was about $8. I spent $3 on the trim, $3 on the MDF and $2 on the magnetic catches. The feet, wallpaper and paint were left over from other kitchen projects. Here's a fabulous example of the transformative power of paint. A few years ago, I scored this table at a thrift store for $20. It's made of solid wood, as evidenced by the weight. Picking up the top is like lifting an entire oak tree. :P It also has two leaves (it's a tree, I tell you!) which store under the table and pull out to approximately double the size of the tabletop. I used it in my workroom for several years, where it suffered the indignity of misplaced paint without complaint. Due to its exemplary service record (and attractive curvy legs), it was promoted to the dining room. To prepare for its new duties, it got a makeover. Sanding the top to remove the old paint was quick and easy, but I was dreading painting because of all the curves and indentations on the legs. Then, a stroke of good luck! I was looking through paint chips at Lowe's and saw that the "Sumptuous Purple" chip had a little note that said "also available in spray paint." Sweet! Spray paint would be MUCH easier for the curvy legs, and I could use matching latex paint for the flat surfaces. This was my first time trying Valspar paint. The spray paint was satisfactory - the spray pattern produced a lot of fine mist, resulting in less-than-stellar coverage and too much overspray. Not a bad choice, but I still prefer Rust-Oleum Painter's Choice for spray paints. 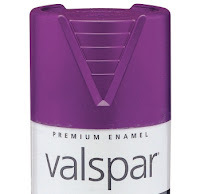 The Valspar latex paint was good; I would use it again. Total cost of this project was about $19. I paid $15 for a quart of latex paint (I used maybe 1/3 of it) and $4 for a can of spray paint. The tablecloth was $8.